in a separate bowl, cream together butter and brown sugar. stir in eggs. mash bananas in another bowl. (no need to put in another bowl if using frozen bananas. bananas are soft enough to put directly into flour mixture.) then mix bananas with flour in large bowl. next combine ingredients of both bowls. add cinnamon, nutmeg, and ginger. stir just to moisten. pour batter into prepared loaf pan. bake in preheated oven for 70 minutes, until a toothpick inserted into center of the loaf comes out clean. let bread cool in pan. heat the oil in a pan, throw in the onion and cook for a couple of minutes. stir in garlic, tomatoes, chili and sugar. season with salt and pepper and bring to a boil. give it a good stir, then reduce the heat and simmer for 5 minutes. meanwhile, bring a large pan of salted water to the boil. add the pasta and cook according to packet instructions. drain pasta, return to the pan and stir in the sauce and basil leaves. serve with a generous grinding of pepper and sprinkle with parmesan cheese. 4 servings prep time: 10 min. total time: 30 min. saute onion and bacon until cooked. no oil necessary. add broth, red pepper flakes, sour cream, and curry. this can be served with rice or noodles. scrub sweet potatoes and poke holes with a fork in each potato. wrap each one in aluminum foil and place on a cookie sheet and bake for an hour. let potatoes cool and then cube. in a medium bowl, mix together all ingredients. mix until smooth. transfer to a 9×13 inch baking dish. place baking dish in oven and bake at 375 degrees for 30 minutes or until lightly brown. 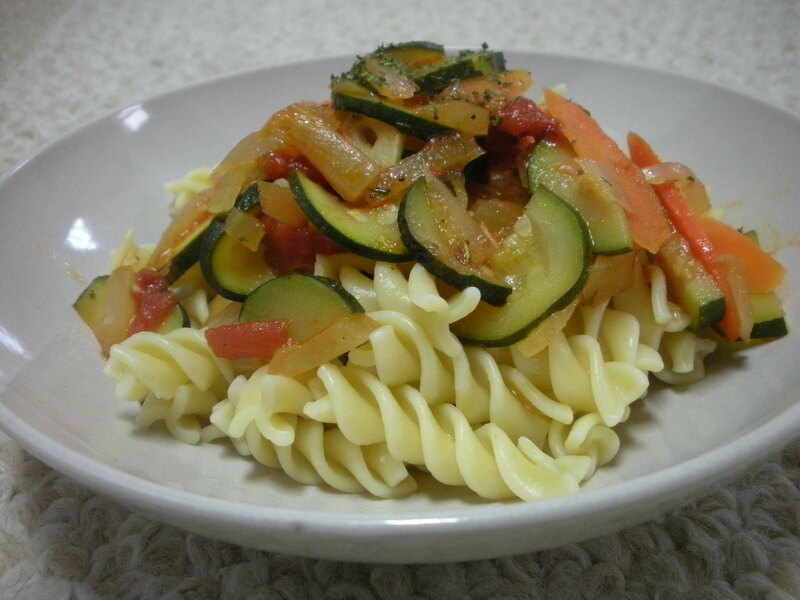 in a large skillet, cook onion, carrot, zucchini, and garlic in hot oil 5 minutes or until tender. add crushed red pepper and fennel seed. simmer, uncovered, over medium heat 3 minutes. stir in pasta. heat through. top each serving with parmesan cheese and parsley.